September is here, which means summer is almost over (sadly)! But who else thinks fall is the best season? 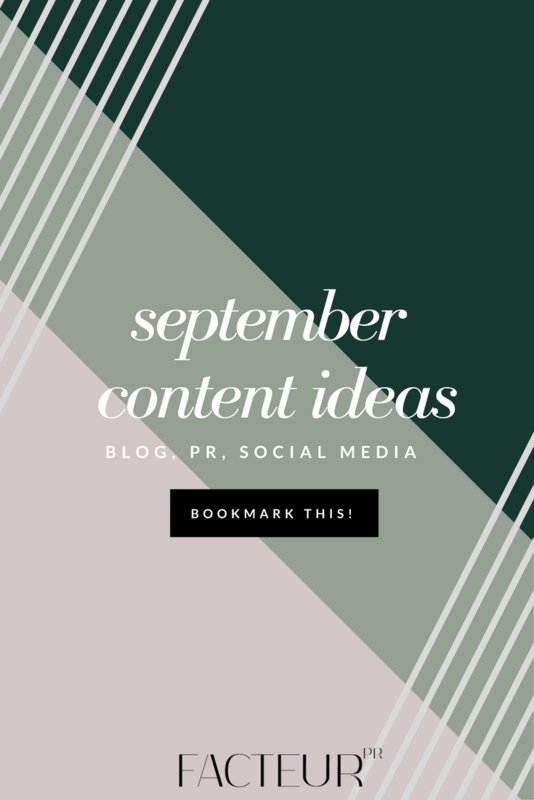 The approaching season has no shortage of great events that can serve as an inspirational source for blogging, and September is no exception. These ideas are also applicable to your social media and media relations pitches. To get you started, here are just a few opportunities this month to align your brand or business with some already note-worthy happenings online. Want more content ideas for the year? These are just a few of the ones we've identified! We have developed four editorial content calendars specifically for the food & drink, arts & hobbies, health & wellness, and lifestyle industries. You can find them under the Instant Resources tab here on the FACTEUR website (and showcased below). We've pulled together social media, blogging, and PR opportunities based on monthly and daily holidays, hashtags, and high profile events that are related to each of those industries. Also included is a list of story ideas to get you started with developing your editorial plan, as well as space to brainstorm your own ideas. We're offering each calendar for $9, and if you buy all four with our Blogger Bundle, you basically get one free! Plus, every time we update the calendars, we'll make sure you'll get the newest iteration (at no extra charge, of course). Happy creating!